I recently had the blessing of leading some kidmin leader training at South Crest Baptist Church in Lubbock, Texas. In that room were 50 of the sweetest, most dedicated kids ministry volunteers I’ve ever met. We laughed, we cried, we prayed for those kids entrusted to us — it was beautiful. I’ve had a few requests for my 13 Reminders for 2012-2013 I shared that night so I thought I’d share them here. Feel free to share with those who work with kiddos in your church if you find them helpful. 1. Be prepared. Your kids, their growth and the Gospel is worth the hour or so of prep it takes to knock it out of the park on Sunday/Wednesday. You can do it! Don’t put yourself on auto pilot. You feel like junk afterward and your kids walk away empty – not filled, joyful and excited about their faith! 2. Be present. Put your phone away. Quit checking Facebook when they kids do their word search. Be 100% focused on your kids and make the most of the hour or so you have with them! 4. Be consistent. Do whatever it takes to be at church every week. Kids need consistent faces – folks they can count on to be there each week to help them grow in their relationship with Jesus. Interacting with a maturing follower of Christ helps them put their faith and trust in Him, too. Maybe you can leave for your vacation on Monday? Or come back a bit earlier to be at church with your kids. 6. Be in prayer. This is often overlooked when you’re preparing your lesson or running out the door, but be in prayer as you prepare, as you drive to church, during your time with kids – prayer should be the foundation of everything you do. 7. Be patient. This one is hard for me. If things don’t go how you planned, or you get sidetracked praying for a kid’s cat – it’s okay! Take a deep breath. The main goal of your time with kids is that they come to know Christ or grow in their relationship with Him. Is that happening? Then you’re good. Be patient with their questions, their energy… Just breathe. 8. Be sensitive. I learned something important while on staff at Brentwood Baptist Church – my first place to serve in kids ministry. It’s called the Iceberg Theory. When you see an iceberg, you just see the tip top – not the 80% or so of it below the surface. This is also true of those we minister to. You may see how a child is responding but not see the part of their lives we don’t know about that are influencing those behaviors. When you know a kid isn’t getting nutritional food at home, that a parent has abandoned them, that their mom is going through chemo – suddenly their actions you thought were “crazy” make a lot more sense. So be sensitive and think about what might be below the surface. 9. Be engaging. Be energetic! (That was two for one!) It’s okay to drink a 5 Hour Energy (or 2!) on the way to church if that’s what it takes to be full steam ahead by the time kids get to your room. Think to yourself – if this was the last hour on earth – how would I tell the story I’m about to tell? What would I tell these kids? How would I tell it? We’re not guaranteed another minute of life. Tell the story. Mean it. Believe it. Point them to Jesus. 10. Be a servant. One thing I feel is missing as I work with college students and kids these days is the lack of an attitude of service. Model servant hood by not just singing “the clean up song” but by serving your kids. Encourage them when they serve others. A servant’s heart is contagious! 11. Be a resource. Parents are with their kids way more hours than the 2 hours you MAY get with them at church if you’re lucky. Do whatever you can to equip parents to lead their kids toward a growing relationship with Jesus at home. Share book suggestions. Make yourself available outside of church. Help parents be the parents God has called them to be. 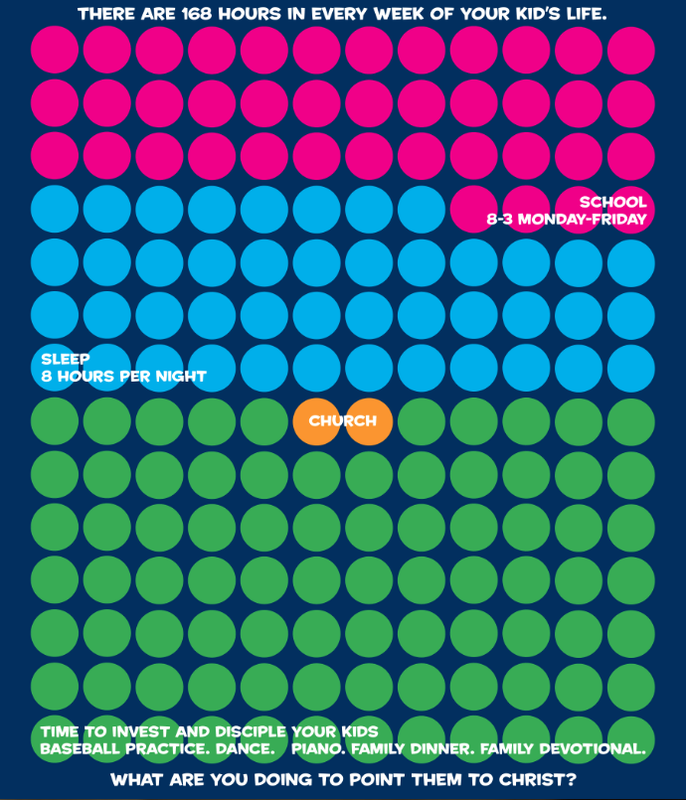 This graphic from the folks at CentriKid Camps showing the hours kids have in a week. Are you making the most of your time with them? Are you equipping those with your kids when they’re not at church? 12. Be YOU! Don’t be afraid to be you – to share about your life, admit when you don’t know the answers – be honest. Be a role model. Be you! 13. Believe. In yourself. In God equipping you with what you need to minister to your kids. Believe that all you do for kids and for Christ is worth it! And it is worth it!You know the Barna stats I’m sure, but if you need reminding: half of all those who accept Christ do so before the age of 13. 64% do so before they’re 18. Just 13% do so between ages 18-21 and less than 1 out of 4 who accept Jesus do so after they turn 21. What you do matters! Kids need to hear and respond to the Gospel. So pray and ask the Holy Spirit to work through you as you guide kids into a relationship with God.